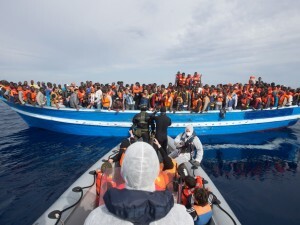 In October of 2015, a little more than a year after taking the World Press Photo Award-winning photo Mare Nostrum, Massimo Sestini launched a project to try to track what has happened to the nearly 500 people aboard the crowded boat rescued by the Italian frigate Bergamini. It started with an online appeal: Do you recognize someone on this boat? Were you on this boat? Where are you? I’m reminded of a conversation I had with a Neapolitan man a few years ago, standing on a tiny balcony overlooking Spaccanapoli, Vesuvius hazy across the bay. “Everything in Naples is a battle,” he said. I wonder if it feels that way if to those 25 newcomers? I don’t know from where they were fleeing, but surely, it was more of a battle than the streets of Naples. The power of Sestini’s project is to answer those questions, tell those stories, and give faces and voices to hundreds of people trying to make a new home in a new corner of the world. Away with the fear of the other. Down with isolationism. No more racism disguised as nationalism. These are the battle cries of projects like Where Are You? These are the battle cries of 6 Degrees. How do we embrace pluralism? How do we benefit from diversity? How do we help re-root the displaced? These conversations are essential, and these stories must be heard. To see if you can contribute to the Where Are You? project, view the enlarged image here. Mare Nostrum is the 2016 6 Degrees Hero Image, used with permission from Massimo Sestini. Read about the Where Are You? project.